The NBA Breakdown offers data-driven analysis for each day’s slate using the FantasyLabs Tools and metrics to highlight notable players. The NBA playoffs get underway on Saturday with a four-game slate beginning at 2:30 p.m. ET. The 76ers should be one of the most popular teams to target on today’s slate. They’ll likely be without Joel Embiid — doubtful with a knee injury as of writing — and their implied team total of 118.75 ranks second on the slate. Ben Simmons should be one of the biggest beneficiaries of Embiid’s absence. Simmons has averaged 35.1 minutes per game with Embiid out of the lineup since the All-Star break, resulting in an average of 44.5 DraftKings points per game. Simmons is an elite value at just $7,800 on DraftKings given his Bargain Rating of 99%. Spencer Dinwiddie has struggled recently, posting an average Plus/Minus of -3.75 over his past 10 games on FanDuel. That said, his salary has decreased by a whopping $2,000 over the past month. Historically, buying players who have seen that big of a salary decrease has been profitable, resulting in an average Plus/Minus of +2.47 (per the Trends tool). Dinwiddie is still expected to play a solid role for the Nets during the postseason — he’s currently projected for 26.4 minutes in our NBA Models — and he’s averaged 0.96 FanDuel points per minute this season. He’s also one of the best pure values at the position on FanDuel, where his $4,900 salary comes with a Bargain Rating of 77%. Steph Curry has not been as valuable from a fantasy perspective since Kevin Durant joined the team — Curry has posted a negative average Plus/Minus each of the past two seasons — but he has the potential to elevate his game during the postseason. Curry averaged 37.0 minutes per game in last year’s playoffs, and he’s averaged 1.45 DraftKings points per minute over the past month. He’s underpriced on DraftKings at $8,300. Kyle Lowry is another PG priced at a discount on DraftKings. He’s only $6,500 for his matchup against the Magic, and he’s never been priced below $6,700 in our Trends database. He should be asked to play slightly more minutes during the postseason and has averaged 1.11 DraftKings points per minute this year. D’Angelo Russell is one of the best values of the day on FanDuel, where his $8,300 salary comes with a Bargain Rating of 92%. He’s also produced at a really high level recently, averaging 1.44 FanDuel points per minute and a Consistency Rating of 91% over the past month. He has an appealing matchup against the 76ers, who have played at the eighth fastest pace this season. Their defense has also been markedly worse with Embiid off the court, allowing 112.7 points per 100 possessions without their star big man this season — the second-worst full-season mark in the league. Gary Harris has been eased back into the Nuggets’ rotation after returning from a groin injury that caused him to miss an extended period of time. That said, he did play 38.9 minutes in their final game of the regular season, which paints an optimistic picture for Harris during the postseason. Harris has still been a solid contributor this season, averaging 0.78 FanDuel points per minute, and he doesn’t need to do much to pay off his current $4,200 salary on FanDuel. The Warriors unsurprisingly own the highest implied team total on the slate at 122.25 points, which makes Klay Thompson an interesting option. He’s always in play for guaranteed prize pools (GPPs) given his boom or bust nature, but he also deserves some consideration for cash games on FanDuel. He’s priced at $5,800, resulting in a Bargain Rating of 88%. Jamal Murray has SG eligibility on DraftKings, which increases his appeal on this slate. Curry, Simmons and Lowry are elite values, so the ability to slot Murray into your lineup without clogging up the PG spot is a plus. Murray has been an outstanding value over his past 10 games, posting an average Plus/Minus of +7.03 on DraftKings, and the Spurs have struggled with opposing PGs all season. His $6,000 salary on DraftKings further increases his appeal and results in a Bargain Rating of 98%. The Raptors have done everything short of wrapping Kawhi Leonard in bubble-wrap to preserve him for the playoffs. Now it’s finally time to unleash him. He’s averaged 1.38 DraftKings points per minute over the past month and should improve on his average of 34.0 minutes per game during the regular season. He’s priced at $7,900 on DraftKings, resulting in a Bargain Rating of 97%. Jonathan Isaac was initially questionable to suit up against the 76ers, but was able to pass the NBA’s concussion protocol. That’s good news for the Magic, as he’s one of the biggest reasons why they were able to win their division and sneak into the playoffs. It’s also good news for DFS players. Isaac has averaged a stout 0.93 FanDuel points per minute over the past month, and he’s projected for 28.5 minutes on Saturday. He’s also seen a price reduction of $1,500 over the past month, and his current $5,000 salary comes with a Bargain Rating of 88%. Kevin Durant has been a fantasy disaster since DeMarcus Cousins joined the rotation, and Durant has posted an average Plus/Minus of -5.03 over his past 10 games on DraftKings. That said, he’s still Kevin Durant. He’s priced at just $8,000 on DraftKings against the Clippers, which gives him big upside. Will Barton is another member of the Nuggets who could be due for a bigger workload in the playoffs. He’s coming off 32.9 minutes in the final game of the regular season and responded with 31.8 FanDuel points. He’s an appealing option at just $4,400 on FanDuel. Tobias Harris is another member of the 76ers who should get a bump if/when Embiid is ruled out of the lineup. Harris has led the team with an average of 35.9 minutes per game without Embiid since the All-Star break, resulting in an average of 34.83 FanDuel points per game. He’s also seen a team-high usage bump of +2.2% with Embiid off the court over that span. Harris is one of the safest options at the position for cash games and has upside for GPPs, too. Embiid isn’t the only injury that the 76ers are dealing with at the moment. Jonah Bolden’s status is also unknown, and his absence would likely result in a large workload for Mike Scott. Scott has averaged a respectable 0.71 DraftKings points per minute this season and is extremely affordable at $3,700 on DraftKings. Aaron Gordon has scored at least 33.7 FanDuel points in four of his past six games, and he’s cracked the 40-point threshold in two of them. He’s very reasonably priced at $6,900 on FanDuel, resulting in a Bargain Rating of 77%. As far as upside goes, LaMarcus Aldridge might have the highest ceiling at the PF position. Aldridge has averaged 1.23 FanDuel points per minute over the past month and is currently projected for 36 minutes in our NBA Models. He posted a usage rate of 31.8% in his final game of the regular season, which was a sizable increase when compared to his season average, and he could be looking at a similar workload on Saturday. Nikola Jokic and the Nuggets got exactly what they wanted heading into the postseason. They got a little creative with their rest down the stretch, which resulted in both Houston and Golden State winding up on the other side of the bracket. Now the Nuggets have to prove that they belong to be in the conversation with the NBA’s elite. Jokic is going to go a long way towards answering that question. He has the ability to dominate, but he also tends to disappear for long stretches. Still, he possesses arguably the highest fantasy ceiling on the slate. He’s averaged 1.56 DraftKings points per minute this season, which is the top mark on the slate regardless of position. And his $9,000 salary on DraftKings comes with a Bargain Rating of 98%. Boban Marjanovic will likely be a popular value option if Embiid is ultimately ruled out. Marjanovic has averaged a stout 1.34 DraftKings points per minute this season, and he’s priced near the minimum at $3,500 on DraftKings. He’s only projected for 17.1 minutes in our NBA Models, but he can do a lot of damage in limited playing time. DeMarcus Cousins has been the most productive center on this slate over the past month, averaging 1.55 DraftKings points per minute. He could see a few additional minutes in the playoffs, and his $7,000 salary on DraftKings comes with a Bargain Rating of 99%. The Raptors biggest concern in their first round series is defending Nikola Vucevic, which makes Marc Gasol an interesting option. Gasol has more size than Serge Ibaka, which could put him on the right side of the playing time split. He’s one of the better values at the position on FanDuel at $6,000. 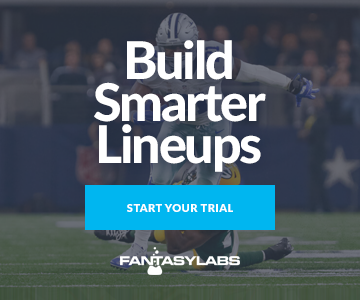 After this piece is published, FantasyLabs is likely to provide news updates on a number of players. Be sure to stay ahead of your competition with our NBA news feed. NBA Breakdown: Friday 3/3 NBA Breakdown: Tuesday 3/21 NBA Breakdown: Target the Shorthanded Heat on Friday NBA Breakdown (Mon. 5/28): Can Harden Lead the Rockets to an Upset?